An understanding of 'ideology' is important for many reasons, not least because it offers you a way to deepen your insights into the ways in which language works to create meaning, and thus a way to increase your exam marks. But knowing more about what ideology is and how it operates on all of our minds is useful because it is such a deeply pervasive thing. None of us can escape our society's ideologies. None of us is free to think entirely for oursleves. Ideological thinking is part of being a member of a society, and a part of being human - and it has on occasions led societies to make disastrous decisions, ones that have impacted the lives of millions. When our thoughts are not our own, we really ought to know this, and to know whose thoughts they really are. 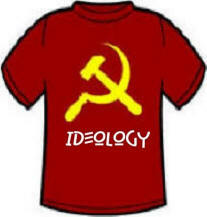 An understanding of ideology will give you this information and, as they say: information is power. A kind of analysis that can be applied to almost any text (including literary, non-fiction and media texts, both print and visual), an analysis that can easily bring in the very highest marks, is an ideological analysis. An ideological analysis seeks to break a text down into those individual parts that can be argued work to reinforce, maintain or subvert society's dominant ideologies. Such an analysis will reveal the most subtle of detail in a text, detail that even the writer might not have been aware of. The techniques you're about to discover can be applied easily to the majority of texts you'll be studying, whether for English Language, English Literature or Media Studies. An ideology is an idea - but not a personal and individual idea such as, 'I have an idea what Laura would like for her birthday'; for an idea to be labelled as an ideology, it must be one that is a part of and helps to form a culture, society or group's 'world-view'; it will be one of the very many shared ideas we hold to such as, 'I have a right to choose what I do with my life' or 'All people have a right to be treated equally' and so on. Sadly, many of these views are not so innocent; at least they were not so in less enlightened times especially. It is good to think that today we are truly liberated and enlightened; but that's not the case, of course. Society still holds to many ideologies that create injustice and which lead to the belief in negative stereotypes. Ideologies are the ideas that we rarely even consider consciously but which powerfully affect the way we think and live. Together, these many ideologies create our 'system of beliefs' (some call this our world view or overall 'mind set'. It is the ideologies we share as a society and culture - often called dominant or prevailing ideologies - that mould and shape our ways of thinking about society, the world and its peoples. a) we hold to these beliefs unthinkingly and usually unquestioningly; but their origin isn't with ourselves; it's always with another person or group. This means that we find ourselves implicitly trusting, often unquestioningly, in another's ideas. b) we follow the beliefs unthinkingly because we see them as being too obvious to question, as common sense or as being a natural way to think. They create a world-view that suggests to us something akin to "this may not be a perfect world but it's the best possible of all worlds". The views seem rational and enlightened. But an examination of the ideologies of the past will soon reveal they aren't always either of those things; so why should today's ideologies be safe and enlightened? The truth is, naturally enough, that they are not, at least not always. An interesting question to ask about ideologies, is how a particular set of someone's else's or another group's ideas manages to catch hold and exert such a grip on individuals who otherwise might likely view themselves as able to think freely? And how do such beliefs spread so quickly and widely throughout whole cultures and societies? And when we do accept someone else's ideas about how we ought to think and live our own lives, shouldn't we ask whose ideas they are, what possible motives lie behind them and who is most likely to benefit from the rest of us holding to them? Some ideological beliefs have a religious origin - it is these that help forge our society's moral values. Many ideologies have a political origin and arise from government and its laws. The media play a part in maintaining and reinforcing certain key ideologies. Literature is thought to be unique in the way it can expose ideologies. It can be shown that texts of all kinds - literary texts such as novels, plays and poems, most non-fiction writing and all media texts - can be convincingly argued to work at an ideological level. This simply means that they work in various ways - and always transparently (i.e. not obviously) - to support and reinforce a particular way of thinking about and viewing the world. It is convincingly argued by political thinkers called Marxists that Western dominant ideologies act to support a particular kind of social structure or society, one that is hierarchical and, thus, competitive, rather than one that is co-operative and egalitarian. Two important modern theorists worthy of further study at A-level are Louis Althusser and Theodor Adorno. If you think, to take just a few examples, of how women were once viewed in relation to men... of how the educated are viewed in relation to the uneducated... of how the rich are considered in relation to the poor... of the old compared to the young, and so on... these are all key dominant ideologies. Each of these could be viewed as not only ways of thinking but of a system of thinking that could be argued to act in ways that keep our culture as a highly competitive rather than a highly co-operative place in which to live out our lives... and competition could be argued to tend to favour the few rather than the many - the rich rather than the poor, for example? When a woman is advised or chooses to end her pregnancy, for example, this is a truly major and very personal decision. The action of ending a pregnancy prematurely can be stated in various ways: 'abortion', 'getting rid of it', 'termination' and so on. Equally the idea of being pregnant has various terms to describe it: "expecting a baby", "carrying a child", "with child", "pregnant" and so on. Can you recognise how and why each of these terms might be called ideologically loaded? This would suggest that the very words and phrases themselves are not "neutral" but carry a social "weight" of meaning and implication. That is, they hold within them more than a basic literal meaning or denotation and, instead, carry various connotations. It would seem fair to say that each carries some kind of cultural or ideological 'baggage', meaning and implication that could be argued to maintain or reinforce a particular way of thinking. Let's think of the ideological 'loading' of the terms. If a woman is going to have a baby, most people today - and she herself - is likely to say that she is 'pregnant'. Not all that long ago, that term was very unusual and was a term restricted to doctors, lawyers and scientists. The everyday term would have been (in the UK anyway), 'expecting', or even 'with child'. The current term - pregnant - has arrived, therefore, via the 'lexicon' of science. It is a part of the same semantic field from where the words 'termination' and 'abortion' originate. Such phrases might be argued to have ideological implications for society; that the change in usage is far from 'innocent' and 'neutral'; even that it is ideologically loaded. This means that the language itself helps to support a particular way of thinking. In this case to support what many see as an enlightened and rational view for a modern society to hold (although the acceptance of abortion is a far from universally held idea, of course): that abortion is a choice for the pregnant woman alone. So just how are these words ideological? When abortion was an unusual, illegal and not widely accepted idea, a pregnant woman might then have described her state as being 'with child' or 'expecting a baby'. The word 'abortion' then seems quite a harsh, perhaps unacceptable idea to link with being 'with child' or 'expecting a baby'. It links mentally much more smoothly with 'pregnant' in the sense that having an 'abortion' when 'pregnant' somehow lightens the act of, what some would say is the killing of a foetus. This isn't to make a political point at all - it's a way to illustrate how language works ideologically. Just when did we stop saying 'expecting a child' or 'she is with child' - and why? Were politicians or the media involved in promoting this change? And if so, how and why was this done? Was it merely fashion or was it to reinforce a particular way of thinking that supports a political view? Is this a more enlightened view - society remains split over this. But it is this kind of questioning that makes studying ideology important and fascinating. Ideologies pervade our minds at every turn; they guide our thoughts; they determine our actions - in ways that can be surprising, sometimes shocking, and occasionally tragic.